These pancakes have a secret. Hiding in the center, just waiting to be discovered and enjoyed. It’s what makes them unique even though the original recipe title from “The Art of Good Cooking” gives no indication that this is anything but your average spinach pancake. 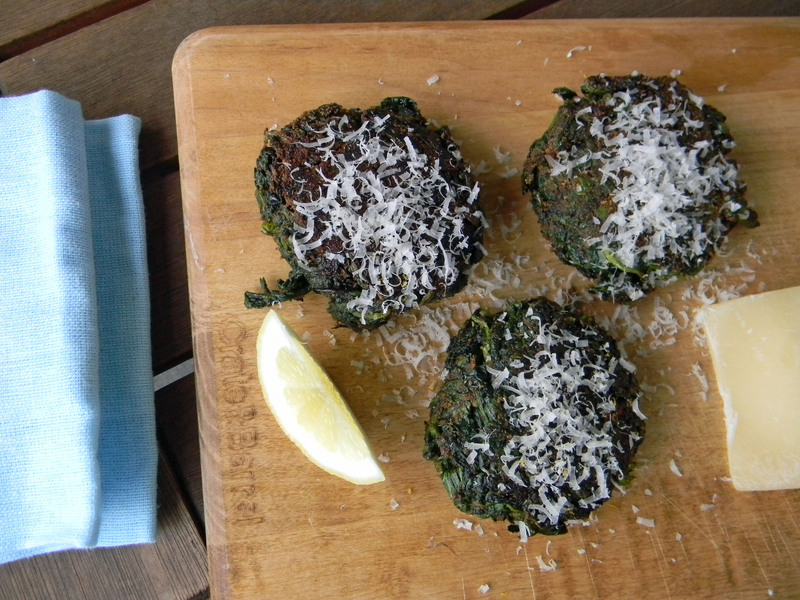 Normally, spinach pancakes are put in the category of zucchini cakes or potato pancakes (like latkes) from traditional eastern European origins. Often considered somewhat “Jewish” though the vegetable variations (i.e. zucchini and spinach) have become more mainstream in recent years with the popularity of frozen meals. For example, Dr. Praegers, a popular line of all natural frozen foods, makes mini spinach patties in different shapes for kids. However, the secret that makes these different from the rest – a slice of hard boiled egg in the center- is pleasantly surprising yet practical. The hard boiled egg not only adds contrast, but provides a much needed protein boost to this light lunch or afternoon snack. Add a little shredded Parmesan (I’m officially guilty of adding Parm wherever and whenever possible…what? It’s not like salt for you? 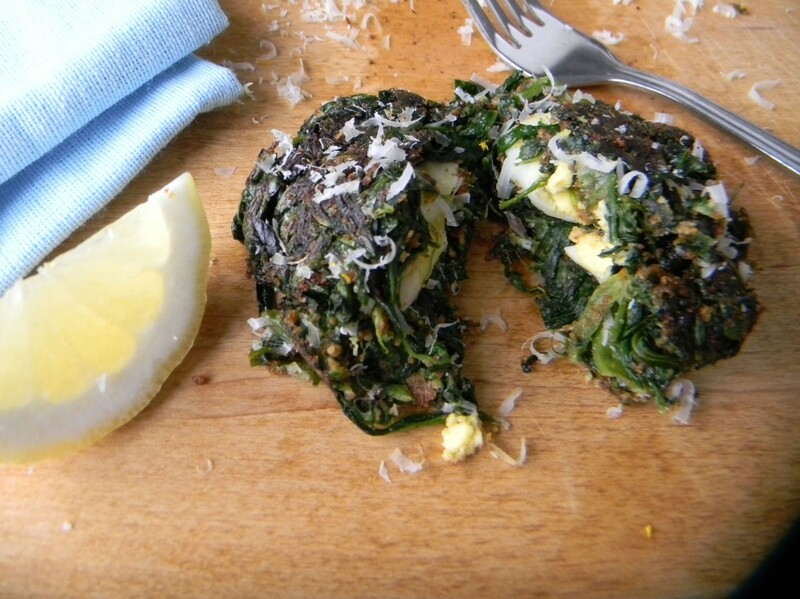 ), a squeeze of lemon, and that somewhat boring spinach pancake just got a lot more interesting. Note: Need spice? Don’t forget the hot sauce! Mix cooked spinach with raw egg, salt and pepper, nutmeg, and 1/4 cup butter (melted). If necessary, add more bread crumbs so the mixture can be handled easily. Wet your hands with cold water. Take about 2 tablespoons of the mixture, shape into a plump pancake, enclosing a slice of hard cooked egg in the center. To serve, melt remaining butter in a large skillet. Saute the spinach pancakes gently on both sides until they are heated through. Remove and top with parmesan cheese. Serve with lemon wedges. Note: pancakes will be extremely fragile and fall apart somewhat easily. To avoid this, a traditional breading method may be used (flour the pancake, dip in beaten egg, and coat in bread crumbs).